Out with the cigarettes. As from January 2013 smoking will no longer be allowed in designated smoking rooms within public areas. Photo: Jason Borg. Smoking in public places will be completely banned within three years and lighting a cigarette will no longer be allowed in designated rooms. As from January 2013, it will be illegal to smoke anywhere inside public places and this includes all enclosed areas such as clubs and restaurants, according to a legal notice. 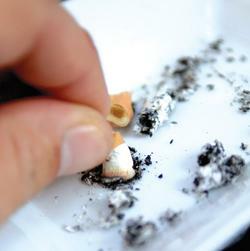 "While it is commendable that health authorities carry on with their campaign against smoking, one cannot neglect the fact that such decisions will have a negative impact on business," said Philip Fenech, president of the hospitality section within the Malta Chamber for Small and Medium Enterprises - GRTU. He explained that when the original smoking ban was introduced in April 2004, several establishments had invested heavily in smoking areas according to the law's specifications. Then, the law allowed smoking areas indoors so long as they were ventilated and totally cut off from the rest of the establishment. "But now the goalposts have been shifted in favour of those establishments with open spaces. As it is, those places that do not have an open space do not even have the option of investing in a smoking area," Mr Fenech said. According to the new Smoking in Public Places Regulations 2010, published in the Government Gazette, smoking in designated rooms will only be allowed until 2013. After that, a complete ban will come into force in all enclosed public areas, including temporary structures. However, smoking will be allowed in individual rooms used for sleeping, like hotel rooms, so long as these are occupied by smokers. Until 2013, smoking will be allowed in designated rooms that will have been registered with the Superintendent of Public Health within two months from the issuing of the regulations. Products bearing the words "tobacco" or "cigarette", irrespective of whether they contain nicotine - like electronic smoking devices - are to comply with the Tobacco Control Act 2010 with respect to advertising and smoking in public places. The 2004 smoking ban was introduced primarily to protect people from the negative effects of second-hand smoke that may lead to cancer and other diseases. The ban had been resisted by smokers and by representatives of the GRTU and the Malta Hotels and Restaurants Association who feared for their business. Despite the stamping of feet, the ban went through, even though the effectiveness of its enforcement has since been questioned by some non-smokers. However, a 2008 study carried out by the anti-smoking campaign HELP: A Life Without Tobacco found tobacco pollution in public places and the presence of carbon monoxide in the lungs of non-smokers had dropped significantly since the ban was introduced. Applications for the registration of designated smoking areas are available from the Department of Environmental Health in Msida or any departmental regional office. For more information call the department on 2133 7333.